Around here, the evening temperatures are dropping, and it’s starting to get a little chilly. The leaves of the mighty maple are on the cusp of turning yellow and so are the little green leaves on the basil plants growing in my kitchen garden back home. It’s time to harvest the basil before the summer’s prized herb starts slipping away. Every year towards the end of the summer, my mom and I start gathering up all the basil and taking it to the kitchen to whip up batch after batch of a family favorite: Pesto. While raw pesto is delicious fresh from the food processor, it also freezes exceptionally well, allowing us to carry a delightful taste of summer well into the winter. You’ll almost always find a container of homemade pesto hidden in one of the families’ freezers, whether it be in my North Philly apartment, my brothers west Philly house, or my parents beautiful countryside home. Our family recipe uses all of the classic pesto ingredients minus the cheese, to create a delicious vegan version of this Italian-inspired dish. Nutritional yeast replaces the Parmesan, but don’t worry, any non-vegan friends surely won’t notice the difference. The pesto is heavy on flavor and nutrients. If you have an abundance of basil on your hands, be sure to make extra to store in the freezer! Cook pasta according to directions, reserving 2 tbsp. of pasta water before draining. Meanwhile, pulse garlic in a food processor. Add in basil, nutritional yeast, 1/3 cup pine nuts, and salt. Begin to puree ingredients, slowly drizzling olive oil into the mixture through the top of the food processor. Add the 2 tbsp. of reserved pasta water and puree until smooth. Heat a skillet over medium high heat. Add 2 tbsp. pine nuts, and toast until pine nuts begin to brown. Remove from heat. Return drained, cooked pasta to the pan and stir in pesto mixture. Place in serving bowl. 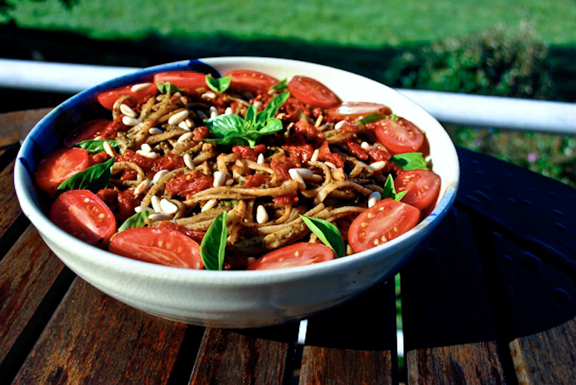 Sprinkle sun-dried tomatoes and toasted pine nuts on top. Garnish with fresh basil and tomatoes, if desired. I just love pesto! The one time I made it, it didn’t turn out as well as I had hoped. I love the addition of sun dried tomatoes. yum! Cool idea! I love pesto and have an overabundance of basil in my garden right now. I’ve never used nutritional yeast but I’m intrigued by vegan cooking. I’ll check out my co-op for yeast and give this a go! Ha, what great timing- I guess there’s something in the air that just calls for pesto! I posted another version of it today, too. Love your tomato-packed take on it! Looks fantastic. 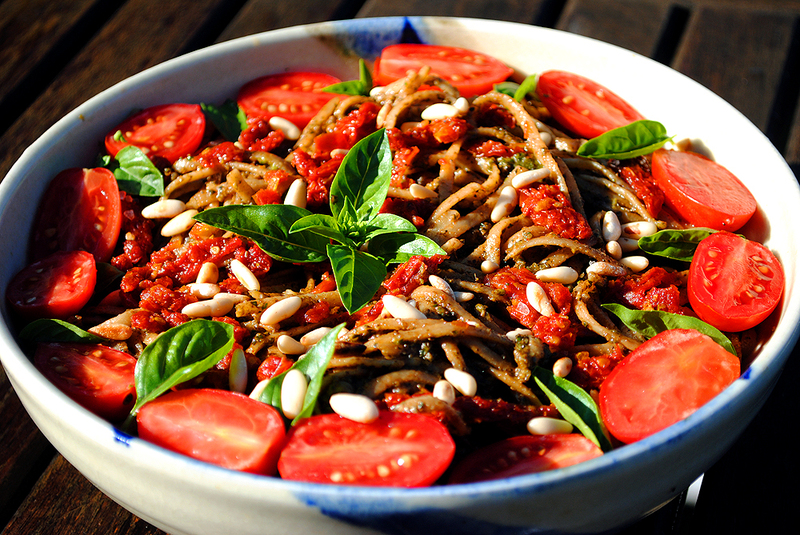 I love the use of whole wheat pasta and changing it a little to make it vegan. This sounds excellent! I think the NY would taste even better than the parmesan, actually. I’m so addicted to that stuff. Thanks for sharing your recipe. Now I need to look for a substitute for the garlic. HA! It’s tough not being able toe at garlic. It really is.